Bartlett City Schools is comprised of eleven schools and approximately 8,000 students located in Bartlett, Tennessee. The Bartlett community has shown a tremendous commitment to creating our local school system, and has generated enthusiasm throughout our city. The Bartlett City School District is looking to build the Bartlett district with a solid core, which is referred to this foundation as “Bartlett City Schools Four Cornerstones for Success.” Primarily, Bartlett must have highly effective teachers in all our classrooms. Research shows that highly effective teachers remain the one school-determined factor that has the greatest impact on student achievement. The second cornerstone is effective leadership. 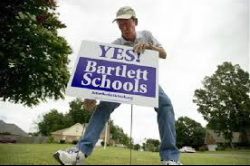 Bartlett must have strong principals in our schools to recruit, develop, and retain our highly effective teachers. Without great principals, Bartlett cannot develop great teachers. Thirdly, a supportive and efficient administrative staff is critical for success. The central Bartlett office must support our schools so that our teachers and students can achieve. District staff will accomplish this goal by being good stewards of public dollars and by ensuring that our teachers have what they need to be successful. The fourth cornerstone is strong parent and community support. Committed parents and community partners will ensure that our students excel.